According to Deadline, Netflix has lined up its next Adam Sandler movie, and this one will have a slightly more impressive pedigree than just Sandler himself. The film is called The Week Of, and it will star Chris Rock alongside Sandler, with Triumph The Insult Comic Dog’s dad Robert Smigel directing. The Week Of will be about the days leading up to a wedding between Sandler’s character’s daughter and Rock’s character’s son, and it will presumably involve some off-the-wall hijinks between the two dads as they struggle with the realities of watching their children grow up and go off to live their own lives. Sandler may be the streaming service’s favorite comedian, but Rock already has a profitable relationship with Netflix of his own. Back in October, the company gave Rock $40 million for two comedy specials, with that fee reportedly being even higher than the ones paid to Louis CK, Jerry Seinfeld, and Amy Schumer for their Netflix specials. 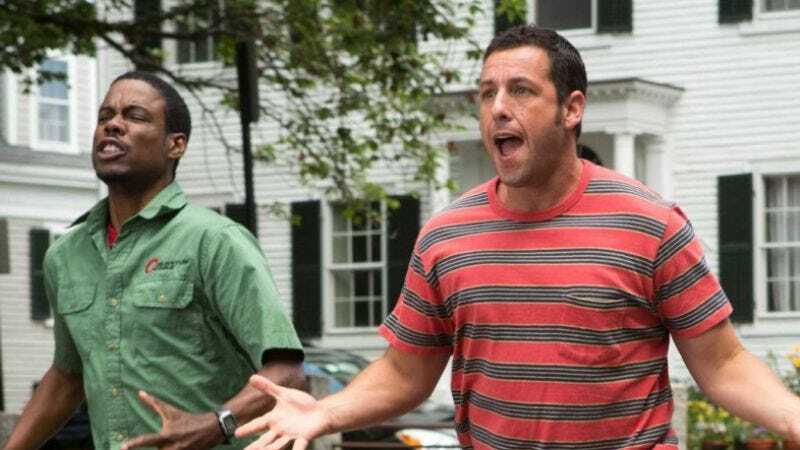 As for The Week Of, it’ll join Sandler’s previous Netflix movies The Ridiculous 6, The Do-Over, and the recently released Sandy Wexler when it premieres next year.